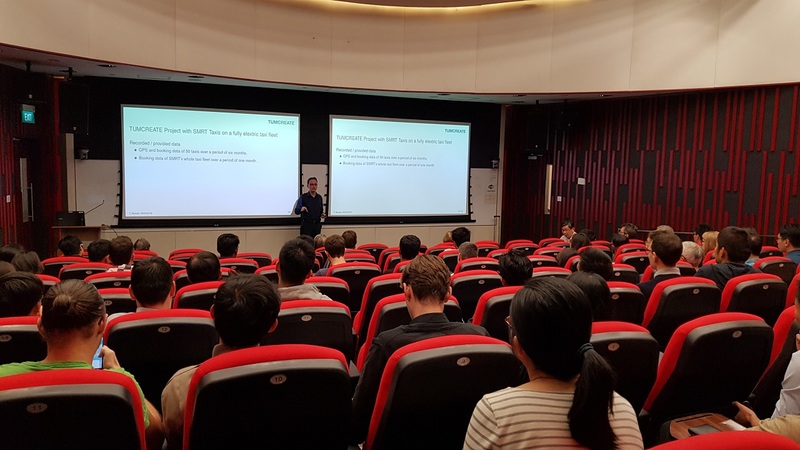 Dr Tobias Massier, Principal Investigator (Electrification Suite and Test Lab) of TUMCREATE shared his views on “Electomobility in Singapore – Where we are today” as part of the CREATE Principal Investigators' series on 6 April 2018. Seven years after the launch of the first EV (electric vehicle) test bed, not many electric vehicles can be seen on Singapore's roads these days. In Dr Massier's view, private passenger cars will not boost electromobility in Singapore since they are expensive and their use is discouraged as they cause traffic congestion, regardless of whether they are electric or not. Hence, there are hardly any incentives to buy an electric passenger car. In 2018, the growth rate of private passenger cars in Singapore has even been set to zero for the first time. During recent years, the focus has started moving away from private cars to public transport and individual mobility. Public transport has made great advances with more MRT lines being built and the Bus Service Enhancement Programme (BSEP) with more than 1000 additional buses and 80 additional bus routes under LTA's master plan 2013. The EV test bed is being continued with e-car sharing and electric taxis. The LTA issued calls for tenders on fully electric and hybrid buses. In addition, autonomous vehicles (AVs) are attracting more and more attention in Singapore these days and it goes without saying that AVs are also electric. In his presentation, Dr Massier talked about past and present events and news in the field of electromobility and the related research and findings at TUMCREATE. Our results show that from a technical point of view, Singapore is ready for electric vehicles. Detailed findings on passenger cars and taxis and their impact on the power systems have been analysed. With today's technology, most of the bus routes can be electrified without the need for on-route charging. Current research focuses on charging scheduling and strategies for TUMCREATE’s proposed DART system and its integration into the grid. Finally, Dr Massier mentioned that electric vehicles could even serve as flexible loads and thus help integrating photovoltaic (PV) power as Singapore plans to install high shares of PV power. Tobias Massier is the Project Principal Investigator of the research team Electrification Suite and Test Lab at TUMCREATE. He joined the company in 2013 and built up a team of currently ten researchers. He completed his PhD thesis at the Technical University of Munich in 2009 and stayed at TUM for three more years to set up and manage the new Master of Science Programme Power Engineering (MSPE). His research interests are charging infrastructure and scheduling of electric vehicles and integration of electromobility and renewable energies into the grid.